of fourteen. He was taught by Professor Hironori Ohtsuka, the founder of the Wado-Ryu Karate. 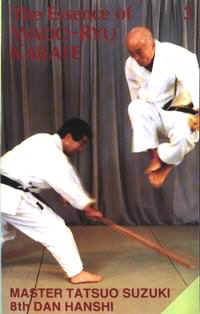 Within six years of beginning his study of Karate, Professor Suzuki was awarded his third Dan. In 1951 he was awarded the then highest grade in Wado-Ryu style Karate 5th Dan for his outstanding courage and ability. In addition to his accomplishments in Karate, Professor Suzuki is a 2nd Dan in Tenshin Koryu Bo-Jitsu (stick fighting) and a 1st Dan in Judo. He has also studied Zen doctrine with the high priests, the late Genpo Yamamoto and Soyen Nakagawa. In 1975 he received his Eighth Dan, the highest grade ever given by the Federation of All-Japan Karate-Do organisations, Wado-Kai. In that year he also received the highest Japanese martial arts title of 'Hanshi' awarded to him by an uncle of the Emperor Higashikuni. Professor Suzuki is the only living person with this title in Wado-Ryu. The only other person was the late Professor Ohtsuka. is Tatsuo Suzuki Hanshi 8th Dan. The Wado-Ryu Karate-Do Academy, led by Masafumi Shiomitsu Hanshi 8th Dan, which is affiliated to the Wado-Ryu Karate-Do Federation, whose chief instructor is H. Ohtsuka II, Grand Master Wado-Ryu Karate-Do, 9th Dan. The Wado-Ryu Aiwakai Karate Federation, led by K. Sakagami Sensei 7th Dan, which is affiliated to the Japan Karate Federation Wado-Kai, H.Q. Japan. Some of the History of Wado-Ryu is featured on Hironori Ohtsuka Page.